I wanted to make a plot in R where the colour of a line depends on the amount of data (amount of sequence reads) supporting it. To do this, I decided to try the RColorBrewer library. This is an R version of ColorBrewer, which can be used to choose beautiful colour schemes for plots. 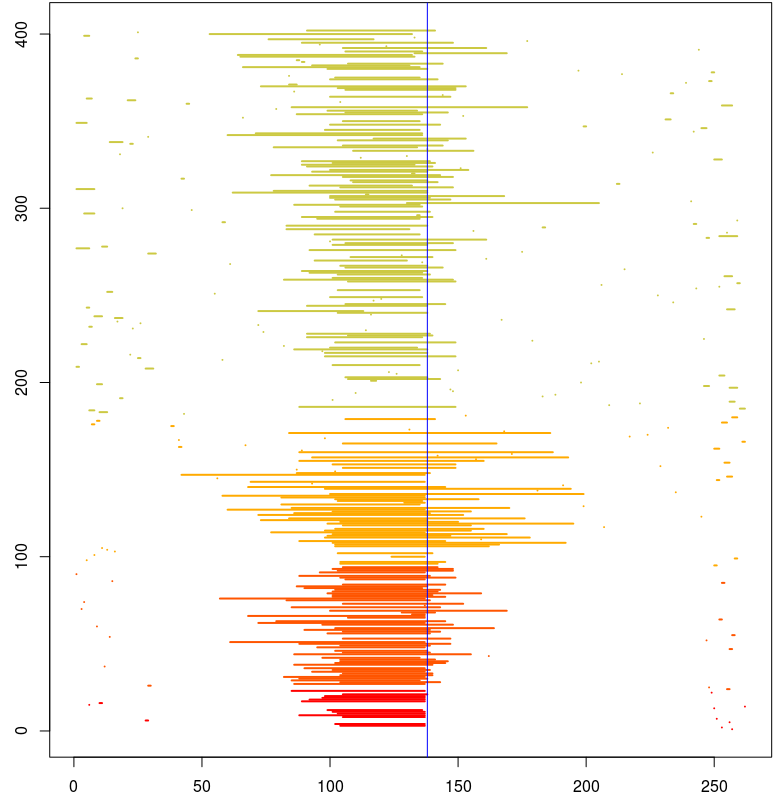 Et voila, a beautiful plot! CRAM is a compressed version of the BAM/SAM formats. To convert a CRAM file to BAM, you can use the SCRAMBLE conversion tool. 27541_1#9.bam is the output BAM file. 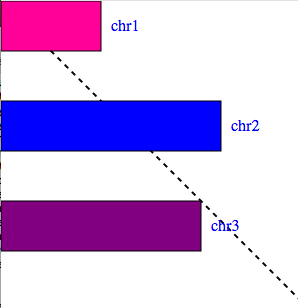 I recently wrote a blog post on using pysvg to make a picture of chromsomes. Now I wanted to figure out how to make a dashed line using pysvg. If you want to change the lengths of the dashes you can change for example 'stroke-dasharray': "5, 5" to 'stroke-dasharray': "10, 10". The BWA aligner for short read alignment is by Heng Li and Richard Durbin. 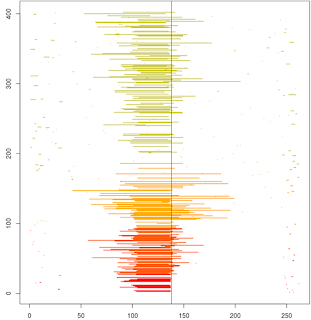 I wrote a previous blogpost on making a plot using pysvg. Now I want to do something a bit more tricky, to adjust the font styles. I found a tutorial online, but the commands in it don't seem to work with the current pysvg that's installed on the Sanger farm. I wanted to figure out how to run Python in a Jupyter notebook, which is like the newer version of iPython notebooks. I found quite a nice tutorial on getting started on Python Jupyter notebooks here. The first step is to install Jupyter. This opens up a web browser showing the files in the directory where I started jupyter. You can then start a new notebook by going to the 'New' menu on the right, and choosing 'python2'. 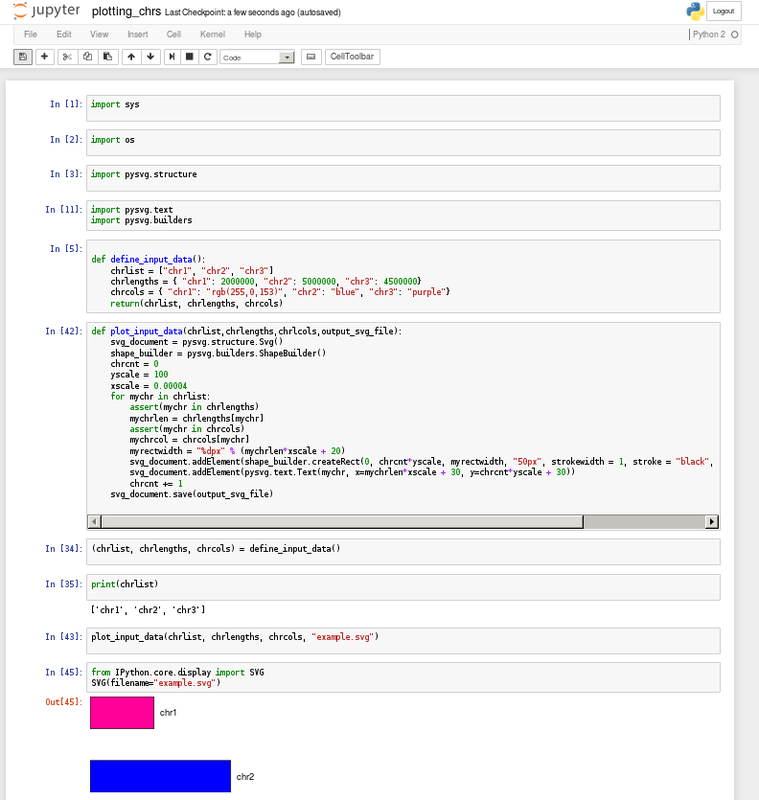 Then you can start typing in the prompt line. To get a line to be executed, you can press Shift+Return. to open this notebook again. 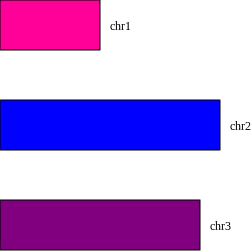 To draw an svg image of chromosomes, here is a little example I made using pysvg (below). I found some nice examples for using pysvg here. Here is another old example (seems to use an old version of pysvg, that doesn't work now) by Noel O'Blog. You can edit it manually in the SVG editor Inkscape (Note to self: do 'ssh -Y pcs5' and then 'inkscape emu_chrs.svg'). # Note 2: this script must be run with python2 (not python3).